A $15 Activation Fee and credit card required. See subscription Offer Details below. The SXV300 radio plugs directly into compatible car stereos from top manufacturers, without the need for special adapters or translators. The compact size installs easily and discreetly behind the dash for a fully integrated look. * Consult car stereo receiver manufacturer for detailed description of features and operations and capabilities. Add Satellite Radio with a dash-mounted, fully integrated look to any car stereo. * Requires FM radio. If your vehicle has an Auxiliary Input, use the included AUX-IN Cable for best performance. Will also work with cassette adapter (sold separately). ** Access to Xtra Channels, Game Alerts, and SportsFlash depends on subscription package. Get SiriusXM Xtra Channels 20+ channels of additional music, sports, entertainment and SiriusXM Latino, a new set of Spanish language channels. You don't need bells & whistles to bring your drive alive. The Onyx EZR makes satellite radio simple to install, use and enjoy so you can focus on the best part – listening. Programming: Able to receive all SiriusXM audio channels and satellite programming packages. 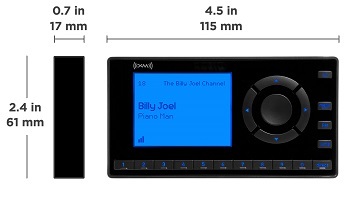 The Alpine INE-W960HDMI comes with the SiriusXM SXV300 Connect Vehicle Tuner. The SiriusXM Connect Vehicle Tuner supports SiriusXM programming with access to 175+ SiriusXM channels via subscription; check out the most popular SiriusXM subscription packages here. Power Acoustik introduces the Incite series PH-620SXMB that an advanced microprocessor and central processing unit to bring lightning fast reaction time to this multimedia entertainment system. Complete package includes SiriusXM SXV300 Tuner and 2-DIN DVD multimedia car stereo with 6.2" LCD. 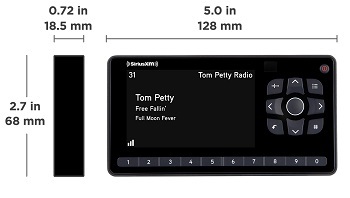 The Sony XAV-AX200SXM comes with the SiriusXM SXV300 Connect Vehicle Tuner. The SiriusXM Connect Vehicle Tuner supports SiriusXM programming with access to 175+ SiriusXM channels via subscription; check out the most popular SiriusXM subscription packages here. 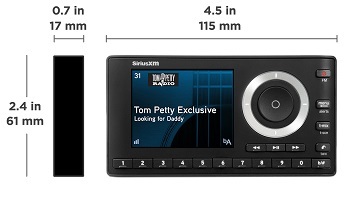 The Dual MXD378SXM comes with the SiriusXM SXV300 Connect Vehicle Tuner. The SiriusXM Connect Vehicle Tuner supports SiriusXM programming with access to 175+ SiriusXM channels via subscription; check out the most popular SiriusXM subscription packages here. Packing 200 watts of power, the MXD378SXM is a ready-to-go SiriusXM satellite receiver head that INCLUDES the SiriusXM Tuner (normally purchased separately). It is a full-featured digital media AM/FM receiver with built-in Bluetooth to allow for audio streaming and hands-free calling, The USB with 2.1 amp charging power and 3.5 mm auxiliary inputs are conveniently located on the front panel and include silicone covers to protect against water intrusion. This unit also features a "Fixed Face" (non-removable) and is "Mechless" (no CD), offering additional protection from the outside elements that can be a common problem like with a traditional CD slot and removable face found on other radios. The AM/FM receiver features electronic tuning with 30 station presets, auto station-store, and 4 preset EQ Curves—Pop, Rock, Jazz or Flat. This package also includes a 40" soft-wire antenna. Add the optional MWR15 wired remote and/or the hand-held RF30 Remote Kit for remote control from anywhere on the boat. 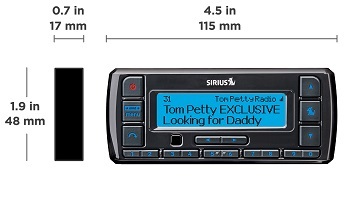 The Dual MCP378SXM comes with the SiriusXM SXV300 Connect Vehicle Tuner. The SiriusXM Connect Vehicle Tuner supports SiriusXM programming with access to 175+ SiriusXM channels via subscription; check out the most popular SiriusXM subscription packages here. A West Marine Exclusive and packing 200 watts of power, the MCP378SXM is a ready-to-go SiriusXM satellite receiver package that INCLUDES the SiriusXM Tuner (normally purchased separately). It is a full-featured digital media AM/FM receiver with built-in Bluetooth to allow for audio streaming and hands-free calling. The USB with 2.1 amp charging power and 3.5 mm auxiliary inputs are conveniently located on the front panel and include silicone covers to protect against water intrusion. This unit also features a "Fixed Face" (Non-removable) and is "Mechless" (no CD), offering additional protection from the outside elements that can be a common problem like with a traditional CD slot and removable face found on other radios. The AM/FM receiver features electronic tuning with 30 station presets, auto station-store, and 4 preset EQ Curves — Pop, Rock, Jazz or Flat. This package also Includes a 40" soft-wire antenna and two 6.5" marine-grade dual cone speakers with dual injection-molded polypropylene cones and poly-coated cloth surrounds. Add the optional MWR15 IPX6 wired remote and/or the RF30 hand-held RF Remote Kit for remote control from anywhere on the boat. OverDryve™ 7 or 8 Pro goes beyond truck navigation and hands-free operations. This ultimate tool for professional drivers includes SiriusXM on-board for all-access commercial-free entertainment. A place where you can hear your favorite music and discover new music, all day long. A place where you can follow every play of your favorite team. A place that motivates and informs you, 24/7. It’s a place where you have the most exclusive entertainment around, right at your fingertips, to enjoy wherever you want. Watch video of performances from our studios. What is the “Never Miss A Beat” promotion? You simply purchase the radio and have it installed. When you call SiriusXM to subscribe you will be offered this promotion which includes 90 days of All Access (Satellite & Internet) service and activation at no charge. You must purchase a minimum 3 month recurring monthly plan of service to our All Access Package. You will need to provide a credit card at time of subscription. You will begin paying for your subscription at the beginning of the 4th month. The savings is more than $60! This includes $20.99 per month of All Access programming and the $4.01 per month Music Royalty fee (plus taxes). What does the All Access programming package include? Over 160 channels + online listening. It doesn't get any better than this — get every channel available on your satellite radio, plus listen anywhere with over 160 channels of SiriusXM on your computer, smartphone and more. This promotion has no end date at this time. SiriusXM does reserve the right to cancel or end this promotion at anytime. If we do cancel or end this promotion we will provide warning. Is there any penalty for turning off the service prior to the 6 months ending? No, there is no longer an Early Termination Fee associated with this program. What if I have an older radio? Can I still get this promo on a new radio ? Yes, If you are replacing an existing radio on your account please cancel the existing radio and Activate the New Radio as a NEW subscription. DO NOT SWAP subscriptions as this may cause an issue in receiving the 3 Months Free Promo. I have a lifetime subscription on my old radio; can that be transferred to this radio? Yes, as long as you have not used up your total of 3 service transfers that all lifetime subscriptions are subject to. A transfer fee of $60 will be charged and your lifetime subscription will be transferred to your new radio based on the subscription package you previously had. What happens at the end of the 6 month promotion period? Do I need to do anything? At the end of your 6-month period you will automatically be subscribed to a paid, recurring SiriusXM All Access subscription plan, as explained in the Offer Details. * The credit card you provided will be charged a recurring subscription at the maximum monthly rate of $20.99 (depending upon the plan you selected), plus any applicable fees and taxes, until you call us at 1-866-635-2349 to cancel. A $15 Activation Fee and credit card are required for this offer. Purchase any eligible radio from an eligible retailer by 12/31/19 at 11:59 PM ET with a monthly All Access subscription and receive your first 3 months free (a minimum of $20.99/mo. savings). Fees and taxes apply. You must cancel within the first 3 months to avoid being charged. Service will automatically renew thereafter and, at the beginning of the 4th month, you will be charged according to the billing plan you choose at then-current rates. Please see our Customer Agreement for complete terms at www.siriusxm.com for complete terms and how to cancel, which includes calling SiriusXM at 1-866-635-2349. This offer cannot be combined with any other. All fees and programming subject to change. SiriusXM reserves the right to modify or terminate this offer at any time. A $15 Activation Fee and credit card are required for this offer. Purchase an eligible tuner (Models SXV200, SXV300, SXV300B, SXV300A, SXV300A2, SXV300D, SXV300E, SXV300K, SXV300S) from an eligible retailer by 12/31/19 at 11:59 PM ET with a monthly All Access subscription and receive your first 3 months free (a minimum of $20.99/mo. savings). Fees and taxes apply. You must cancel within the first 3 months to avoid being charged. Service will automatically renew thereafter and, at the beginning of the 4th month, you will be charged according to the billing plan you choose at then-current rates. Please see our Customer Agreement for complete terms at www.siriusxm.com for complete terms and how to cancel, which includes calling SiriusXM at 1-866-635-2349. This offer cannot be combined with any other. All fees and programming subject to change. SiriusXM reserves the right to modify or terminate this offer at any time. A $15 Activation Fee and credit card are required for this offer. Purchase the Commander Touch vehicle radio from an eligible retailer by 12/31/19 at 11:59 PM ET with a monthly All Access subscription and receive your first 3 months free (a minimum of $20.99/mo. savings). Fees and taxes apply. You must cancel within the first 3 months to avoid being charged. Service will automatically renew thereafter and, at the beginning of the 4th month, you will be charged according to the billing plan you choose at then-current rates. Please see our Customer Agreement for complete terms at www.siriusxm.com for complete terms and how to cancel, which includes calling SiriusXM at 1-866-635-2349. This offer cannot be combined with any other. All fees and programming subject to change. SiriusXM reserves the right to modify or terminate this offer at any time. A $15 Activation Fee and credit card are required for this offer. Purchase the OverDryve™ 7 or 8 Pro from a participating retailer by 12/31/19 at 11:59 PM ET with a monthly All Access subscription and receive your first 3 months free (a minimum of $20.99/mo. savings). Fees and taxes apply. You must cancel within the first 3 months to avoid being charged. Service will automatically renew thereafter and, at the beginning of the 4th month, you will be charged according to the billing plan you choose at then-current rates. Please see our Customer Agreement for complete terms at www.siriusxm.com for complete terms and how to cancel, which includes calling SiriusXM at 1-866-635-2349. This offer cannot be combined with any other. All fees and programming subject to change. SiriusXM reserves the right to modify or terminate this offer at any time.